Number of Lives Saved:- 25 JH Barrow of Lancaster, crew of 4 towed to Longhope. The KTJS was the first motor lifeboat to serve at Longhope, she was a single-engined, 45 foot 6 inch, Watson class, non-self-righting lifeboat. She was built by S E Sanders of Cowes in 1926 at a cost of £8,330. A notable rescue was that of the Brackenmoor. 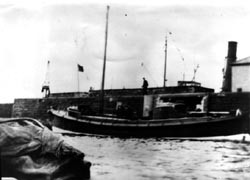 On the 5th of Jan 1930, an Aberdeen trawler ran ashore at Tor Ness. The crew signalled an SOS with flares and the siren. The lifeboat was launched at 2.00 am into a south-easterly gale, being hampered by darkness and heavy rain she reached the casualty at 3.00 am to find her lying close to rocks in a heavy swell which was frequently engulfing the trawler. Cox. John Swanson came in close and dropped anchor veering down towards the trawler but tides swept the lifeboat past the casualty and so a second attempt was made. It was the third attempt when a line could be fired to the stranded trawler, the crew were rescued by breeches-buoy. There was one casualty, the skipper of the trawler who was found to be dead, as a result of heart failure. The Lifeboat returned to Longhope at 6.45 am to land the survivors. 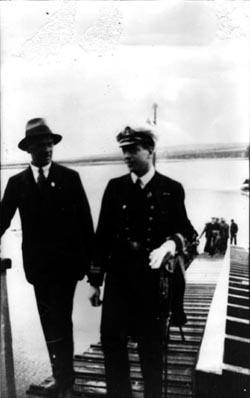 The rescue resulted in the cox being awarded a silver medal and the crew a thanks on vellum. 1932 Silver Second-Service Clasp awarded to Coxswain John Swanson for the rescue of eight of the crew of the trawler 'Dorbie' of Hull wrecked at Tor Ness on 9 January.